It is an outstanding species with its strikingly beautiful, sword shaped flat spines. This plant will bloom even when quite small but need a lot of sun. 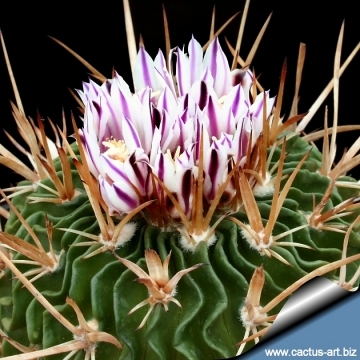 Description: Stenocactus gladiatus (Formerly known as Echinofossulocactus gladiatus) is one of the many geographical form of the widespread and morphologically variable Stenocactus fasciculatus. Many of its morphological and geographical variant was early classified as different independent species, but nowadays all this plant are considered part of a multiform species, where each form is linked to others by populations of plants with intermediate characteristics. The name Stenocactus gladiatus is used to indicate plants characterized by large, wide and flat central spines directed upwards, but similar plants with wide and flat central spines are commonly found in other populations and to all intents and purposes it is a synonym of Stenocactus crispatus. The wavy dark matt green ribs contrasting vividly with the pale wool of the new areoles. The plant still found in cultivation under the name of Stenocactus gladiatus are quite variable and the dissimilarity among seedlings spination may be considerable. Stem: Ovoid to oblong ca. 12 cm tall, 10 cm in diameter, brightly bluish-green. Ribs: 14-22 (or more: to 30). Radial spines: 4-6 on the lower par of the areole, straight, glassy, 8-12 mm long, and 3 reddish-grey in the upper part of areole of which the central one is flat-pressed directed upward up to 3 cm long the lateral are shorter. Central spines: 1 Horn coloured right-angled, with dark tip, longer and more rigid, directed upward up to 4 cm long. Flowers: White with carmine- red central strip (or yellowish? ), about 2 cm long and wide. Notes: Plant with wide flat central spines labelled (Echinofossulocactus) Stenocactus gladiatus are frequently seen in cultivation and in nurseries catalogues, but the descriptions of this species by individual authors are so different, that it is doubtful, if this name is correct. S. gladiatus is in fact very similar (if not the same) to Stenocactus crispatus and particularly to Stenocactus violaciflorus, but this description fit also for Stenocactus lamellosus. By the other hand other authors say that this name probably does not apply to a member of this genus. .Identifying the species of an Echinofossulocactus is as difficult as identifying the genus is easy. For the most part, they tend to look alike, and there are far more names than there are species. 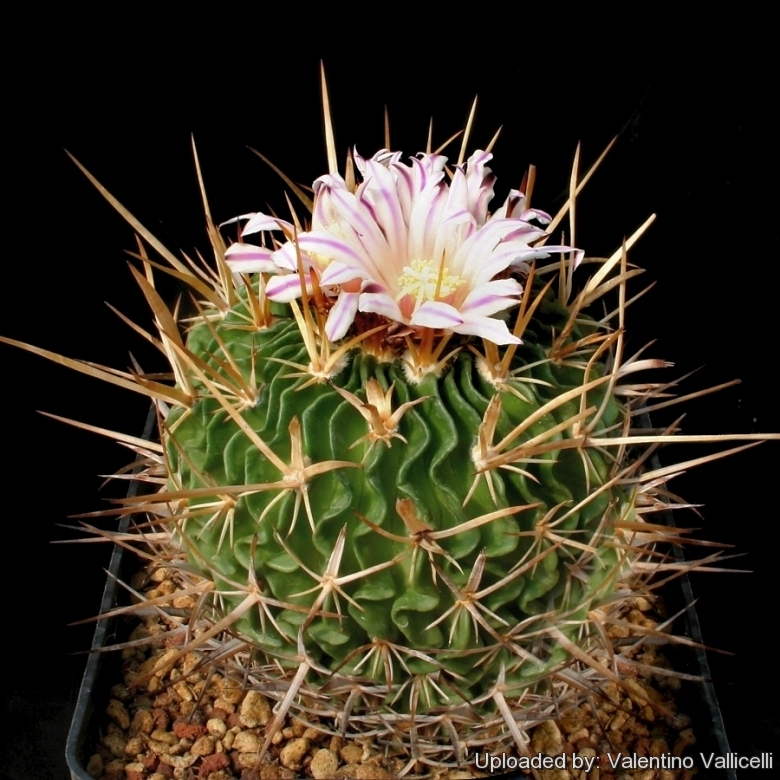 Cultivation and Propagation: Stenocactus gladiatus is easy to to care cactus, recommended for any collection that needs lots of light with ample airflow.